BBC Two - Requiem for Detroit? 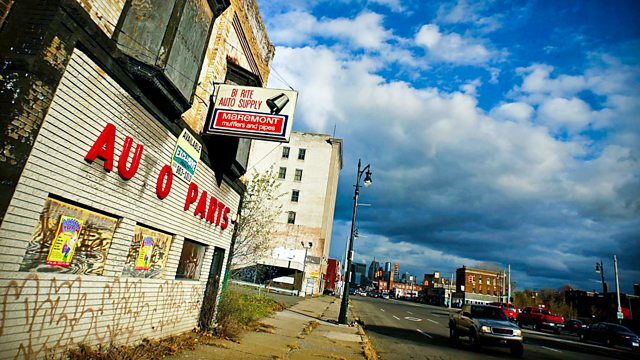 Built by the car for the car, Detroit was the embodiment of the American dream. Now it leads the way again but in a very different direction. Julien Temple's documentary is a vivid evocation of an apocalyptic vision - a slow-motion Katrina that has had many more victims. Detroit was once America's fourth largest city. Built by the car for the car, with its groundbreaking suburbs, freeways and shopping centres, it was the embodiment of the American dream. But its intense race riots brought the army into the city. With violent union struggles against the fierce resistance of Henry Ford and the Big Three, it was also the scene of American nightmares. Now it is truly a dystopic post-industrial city, in which 40 per cent of the land in the centre is returning to prairie. Greenery grows up through abandoned office blocks, houses and collapsing car plants, and swallows up street lights. Police stations and post offices have been left with papers on the desks like the Marie Celeste. There is no more rush hour on what were the first freeways in America. Crime, vandalism, arson and dog fighting are the main activities in once the largest building in North America. But it's also a source of hope.